Posted in Orphanage on May 12th, 2011 by admin – Comments Off on Sidhi Astu and Palasari Orphanage…. When you visit Sidhi Astu you will get a wonderful surprise to see how happy the children are, how clean the orphanage is and how yummy the food looks. One of the big reasons I chose Sidhi is is that all the sponsor money goes straight to the Orphanage. There is no middle man, no advertising cost, no admin costs. After your visit if you wish to sponsor a child please drop me a email Sidhi – see above email. Risky is now all grown up & working in the Tourist Industry. Hi my name is Bronwyn and my family and I live in Brisbane. I would love to share my very new sponsorship experience with you. 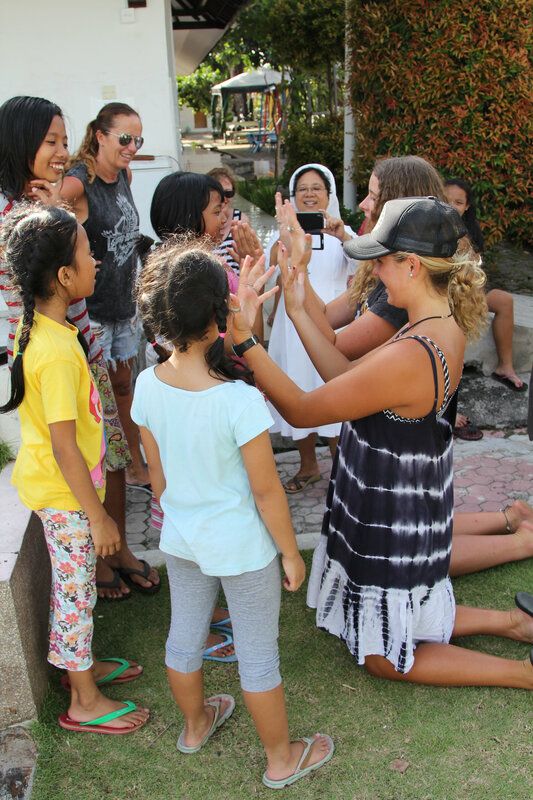 My introduction to Foster Parents Indonesia is a very recent one and came about when I was communicating with Nikki, a long term sponsor, about all things Bali. 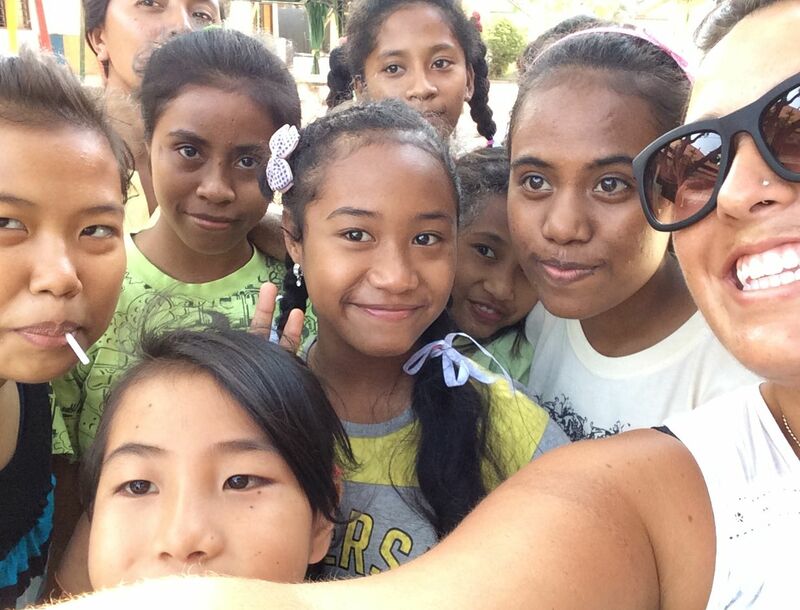 I had been searching for exactly the opportunity Foster Parents Indonesia offered, and Nikki’s passion mirrored mine. I then spoke to Chelsea for more info and I knew for sure I had found a way I could make a real difference. I didn’t even wait for the info that was being posted to me, I was in! I immediately filled out and sent off my application form and transferred the half yearly amount. As we are a family with 2 daughters we decided we wanted to sponsor a girl and asked Kim if that would be possible. It was! Then the wait began. It was no more than a week, but it felt like forever, in fact it felt like I was waiting to give birth again! I was in fact a very expectant parent! Then late one Sunday afternoon an email arrived from Kim titled “meet your sponsor child Nonik”. I was nervous, I was excited, I was experiencing any number of emotions, just reading the title, as I knew I was about to “meet” a little girl that was now a part of our family and lives. I clicked on her profile and there she was. Our beautiful, beautiful Nonik. Even writing this I am a little teary as I’m recalling how incredibly overwhelmed I was. I was in floods of tears, tears of happiness and it surprised me completely how overwhelmed I was. Your experience may be/have been different and will be / have been no less poignant, but that’s the raw truth of mine. I’d heard of love at first sight, had experienced it twice with the birth of our daughters, but here it was again. A bit over the top you’re thinking? I would be too, had I not experienced it. Who knew?! I then, still not even having composed myself, sent a return email to Kim, and one to Nikki, and I think there was some adjustment of mascara needed all round! We had already had another trip planned to Bali and it then took on a whole new meaning as it meant that my husband and I could actually meet our girl! I’m not sure why but it took me weeks, if not months, to compose a letter to Nonik introducing ourselves , telling her all about our family and telling her we would be visiting her the very next week. 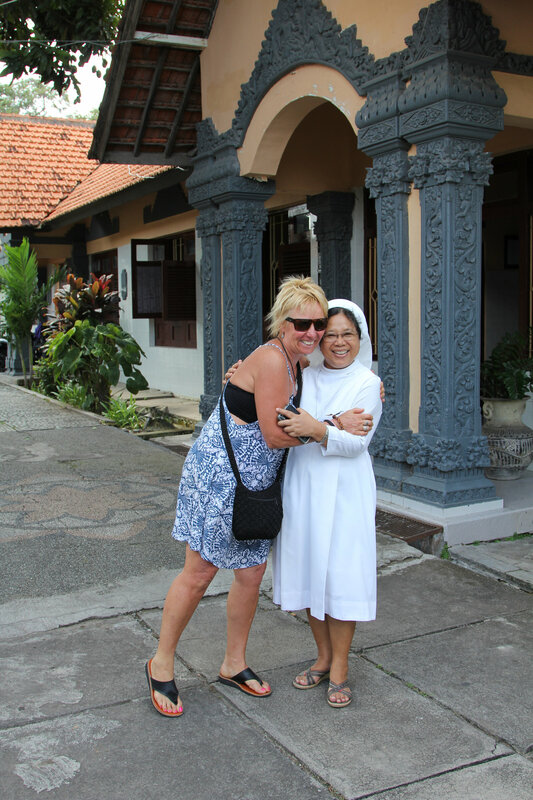 A few hurried emails between Kim and Ms Dewi and we were visiting 2 days after our arrival. We did a little day tour that morning with our driver who knew how to get there , as the kids weren’t due home from school until 12.30pm,and I must admit it’s all a bit of a blur, as my mind was elsewhere! 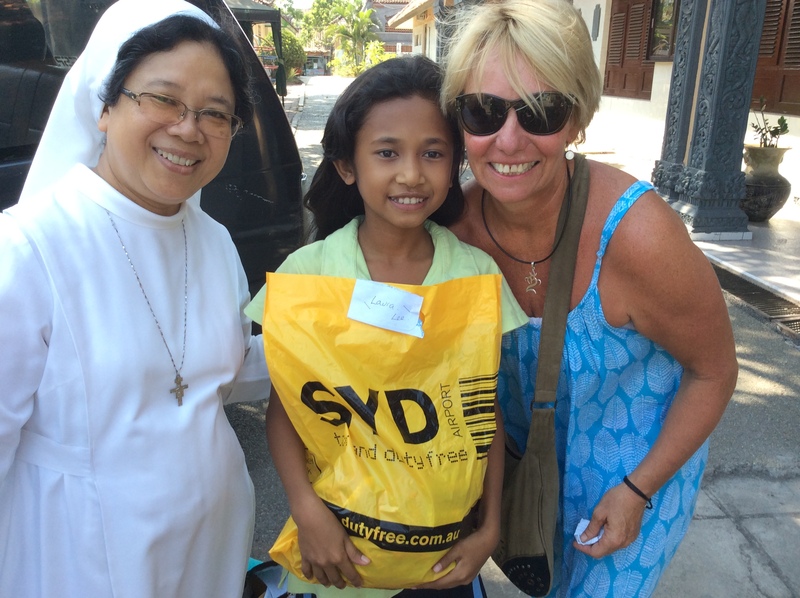 A quick stop at a local supermarket had us loaded up with some supplies for the orphanage. I was again both nervous and excited. Also hopeful I could control my emotions and not frighten this dear child. 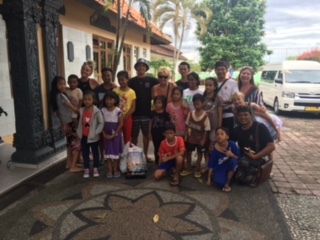 We were welcomed by the Sisters and staff and Ms Dewi and had a chat then in came ALL the kids, one by one, shaking our hands and beaming hellos. In the middle of them came our girl and of course I spontaneously hugged her! 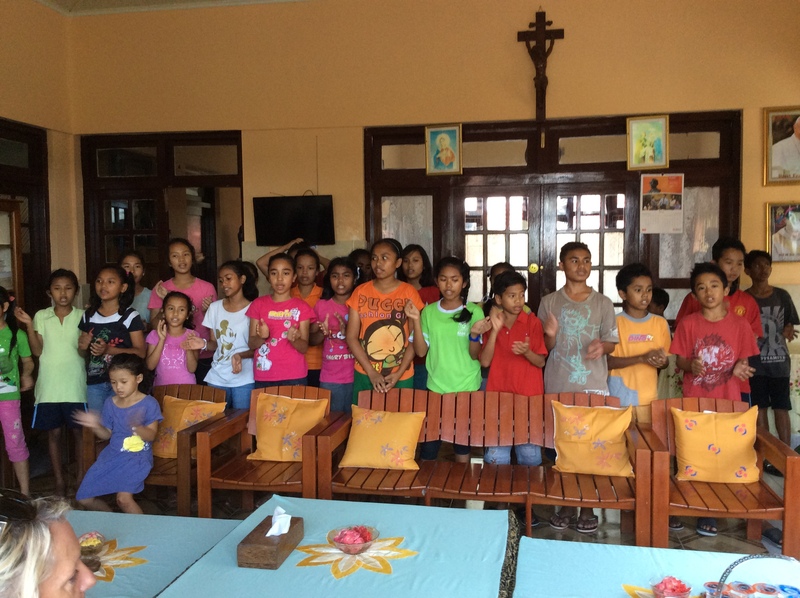 These beautiful, happy children sang us songs, well rehearsed but delivered very sincerely. They then all thanked us again and Nonik and her friends stayed behind for a chat. 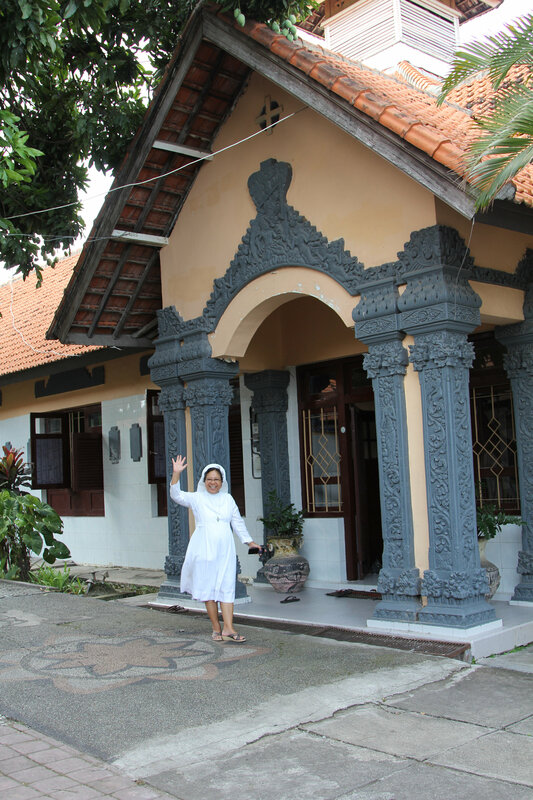 Ms Dewi explained that Nonik’s friends were with Nonik when she read our letter to her, and they were equally interested in meeting us. We had a few photos on our phones etc and the girls were all very interested and knew our daughters names and our precious little dog’s as well! We were then taken on a tour of the orpahange and both the girl’s and the boys dorms and rooms as well. We saw her bunk bed, where she had all her belongings, one cupboard for personal and one for school. She giggled and pretended she didn’t want to show us as she said it was a mess! I laughed and said she really did fit in with her foster sisters! 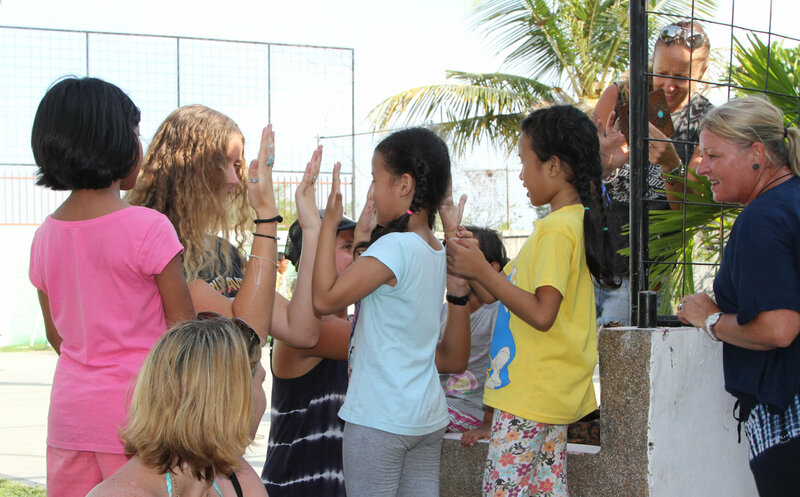 What struck us the most was how incredibly happy the kids were and their interaction with each other and the Sisters and staff were exactly that of a family. They are loved and well cared for and clearly all care for each other also. 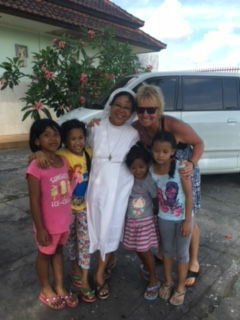 The Sisters and staff are no less than living Saints. That is no exaggeration. All too soon it was time to leave after many photos and cuddles . the kids all have chores to do each day too. They rise at 4am if they are on breakfast duty or 4.30am if not! School starts at 7.30am and they must have their beds made, teeth brushed and showers every morning before school. They have a rest period in the afternoons after lunch and their chores. I must at this stage mention that whilst my husband was very supportive, but although had never said as much, I knew that he was somewhat sceptical up to this point. However the minute we were out of the driveway he was asking what more we could possibly do! And to now hear him talk about her and all that is done by the orphanage and Foster Parents Indonesia with such pride and conviction is truly adorable. Of course once was never going to be enough for us, so back again we went on the kids’ final day of school. We were able to be given Nonik’s school report hot off the press. She is doing very well of course. We decided that we should have an end of year ( their school year ends in the middle of the year)school party so we arrived with 80 party boxes ( containing rice or noodle dish, a cake and a drink)and enjoyed a meal with the kids and some staff. 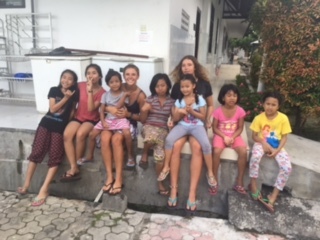 ( there were a lot of visitors this day so everyone was a bit scattered about) Our Indonesian is nil, the girls’ English is halting, but we managed to stumble through a lovely meal with Nonik and her best friends ( who we have dubbed “the 4 amigos”)with lots of giggles and hand gestures! Before this 2nd visit I asked Ms Dewi if it was appropriate to ask Nonik what she might like us to bring her. It was and Nonik’s requests were for, and I quote “girl face cleanser,soaps, hair bands and clothes for church”. Couldn’t our kids take a leaf out of their book when asking for things! We arranged with Kim, and executed with Ms Dewi, a tiny allowance to be paid into Nonik’s building society account. ( I believe each kid has one) We asked that she be able to use that for whatever she wanted. 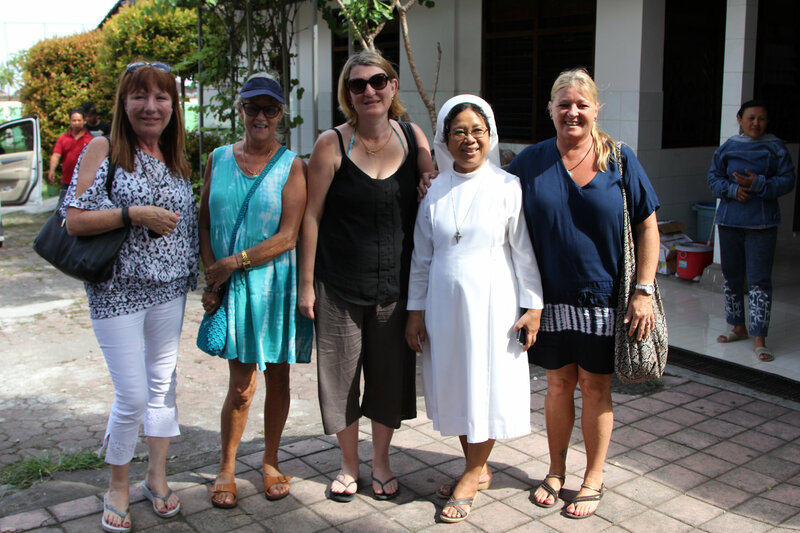 She explained to me, via Ms Dewi, that she would use that money when needed for such things as attending school excursions, swimming lessons and the like, and for extra lessons around exam time. 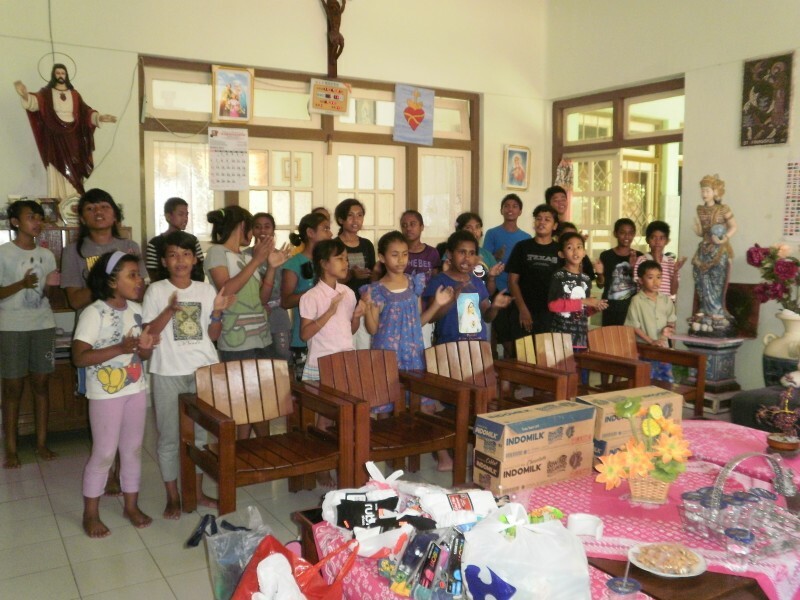 It was explained to me that the orphanage supplied everything they needed and that the aforementioned were not necessarily considered as necessities. So little to us means so very much to them. 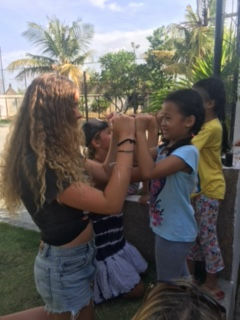 We walked across the road with “the four amigos” ( them urging us to be careful of the traffic and all of us singing One Direction and Katy Perry songs! )to the building society and that tiny amount was deposited proudly into her passbook. Without prompting Nonik said in perfect English “thank you Bronwyn”. 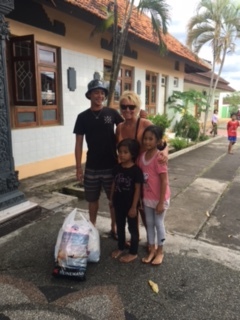 Since our return just 3 weeks ago my best friend Melissa and her family, in Sydney, has now sponsored Nonik’s older brother who also is at the orphanage. 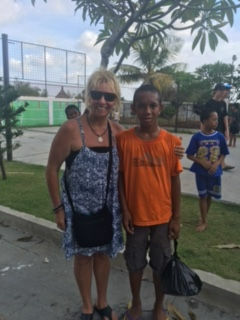 I realise this all sounds a bit clichéd , but thank you Foster Parents Indonesia for bringing Nonik into our lives. It feels like it was destined to be. 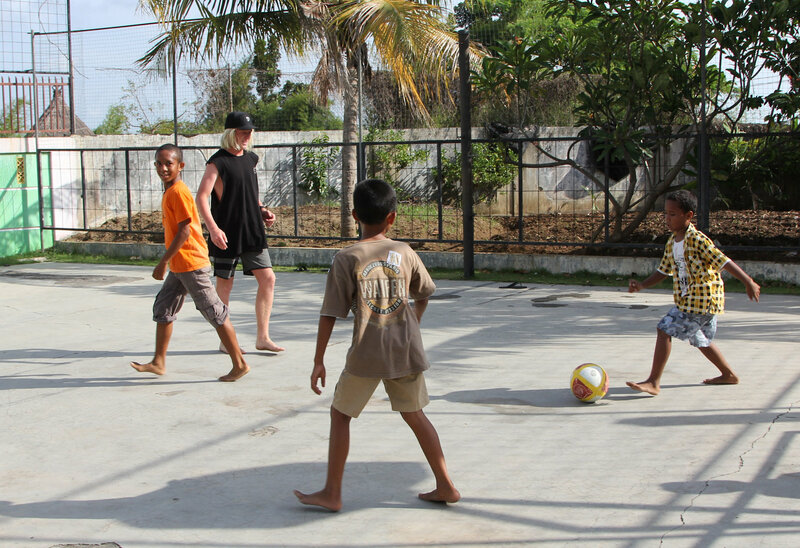 We now have 3 daughters, one of which just happens to live in an orphanage in Bali. And to all the sponsors, and future sponsors, we have witnessed first-hand how much your kindness is appreciated and how it can change lives.